The debut of Dorney Park and Wildwater Kingdom's 2017 season not only includes two new rides, a new show, a huge new catering area and more, it also includes more food and beverage offerings and related changes than we've seen in some time. To that end, I was lucky enough to work with the park on a look at their improved culinary offerings - and that means tasting an awful lot of food over the three-day opening weekend. Considering I mostly write about roller coaster and rides, taking on this food story was intimidating at first but I do love to eat, so in the end it turned out to be a natural fit. It is no secret that food and beverage plans are a big push in the industry in general, and I'm happy to report that I was an early adapter and am now in my second season of having all-season dining. That's important because one of the main points of my quest was to understand just what was offered by the park for guests like myself... but also for daily visitors who want to enjoy a food or beverage plan. And there's several to choose from. Season pass holders can go for All Season Dining as an add on to their season pass, and there's also an All Season Drink Refill option as well. Daily visitors can get a Single Meal Deal or All Day Dining, and mix in a low-price beverage refill plan as well. It may seem confusing at first, but really the point to be made is that all of these plans let you head to more than 15 locations in the park, look for the dining logo seen on the flag in the photos above, choose your meal and dig in. Those are the basics, and feel more involved in text than in reality, to be short it's a breeze to use the plans in person. I know because I have, and I have a lot! I'm still full from my weekend of eating, which I hashtagged on Twitter as #DiningThroughDorney... sadly it never started trending. I kid, I kid. We will get into the food a bit more in just a bit, but the park was also kind enough to let me spend some time with two key players in Dorney Park and Wildwater Kingdom's food and beverage team, the park's Director of Food and Beverage, Katie Knopf and Executive Chef, Malo Jones. Katie on the left, Chef on the right! It takes what feels like an army to pull off the park's food and beverage operations, but these guys are certainly two of the key players in all that. Working hand in hand, they play a huge role in the wide variety of food offerings that are created each day for park visitors. Chef has been with the park for two seasons now, and Katie's tenure extends far beyond that. They not only care about getting fresh, delicious food to guests, but also about the employees making it. They both echoed the sentiment that they view themselves as role models for younger employees, happy that they can help mold them as they work through the year and gain valuable experiences. "A part of Katie's original plan in adding an Executive Chef was to have the kids work with someone who is approachable and is willing to invest in them and be patient and understand and that's really the vision of the four corner stones of what we do," says Chef Jones. 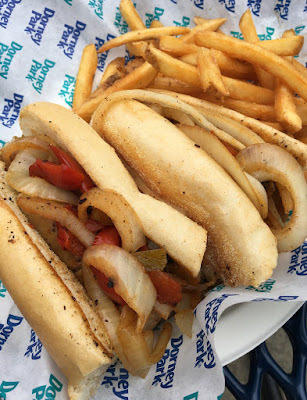 It is easy to think of amusement park food as just your basics like hot dogs, hamburgers and chicken, and while those classic are readily available at the park, there's also so much more. If you're hungry go get a snack, because it's time to look at some food and you're stomach is going to be growling! In speaking with Chef Jones, it is clear that one of the most popular locations for dining plans in Dorney Park is the Smokehouse Barbecue. The barbecue is prepared daily just outside the location, slow cooked over many hours to get the dishes perfect. Above are a couple photos of that process in action - the pork is basted every couple hours to keep it as juicy and delicious as possible. The park makes nearly all of the location's sauces and spices in-house to keep dishes consistent and of their quality levels. 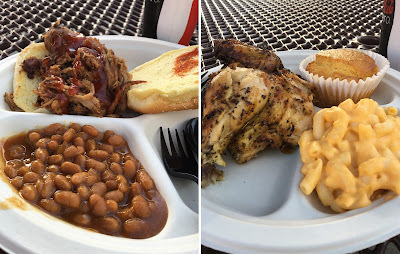 Smoked pulled pork sandwich with baked beans, and fresh rotisserie chicken with mac'n'cheese and cornbread from Smokehouse Barbecue. 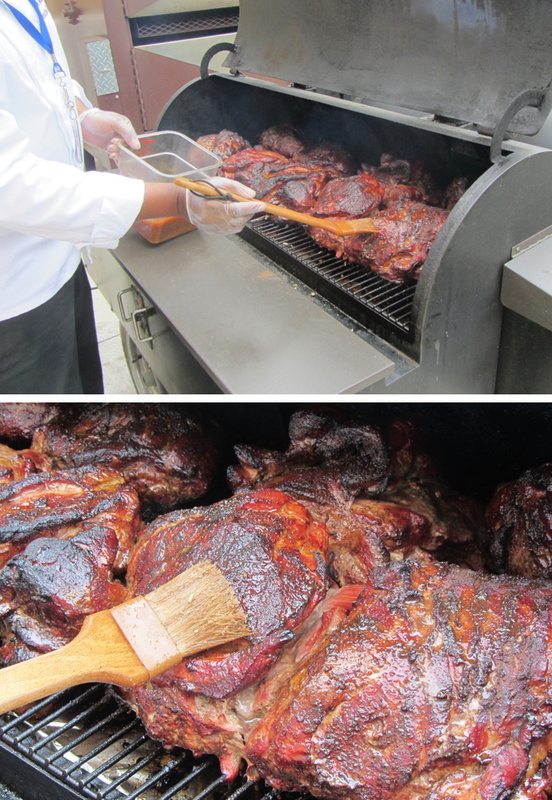 The freshly prepared food is probably a big draw to Smokehouse Barbecue, and it's offerings are delicious. You can tell how much care is put into the food when you taste it, the options we tried are seen above. Chef Jones pointed out that they enjoy locations like Smokehouse Barbecue that create items that work in "addition to amusement park classics," but that "we're leaning more toward culinary items as our clientele is changing, and expectations for food service, quality, consistency and variety change. We're moving in a direction with culinary piece by piece to enhance the overall experience when visitors come into the park." Those efforts have not gone unnoticed, Chef! 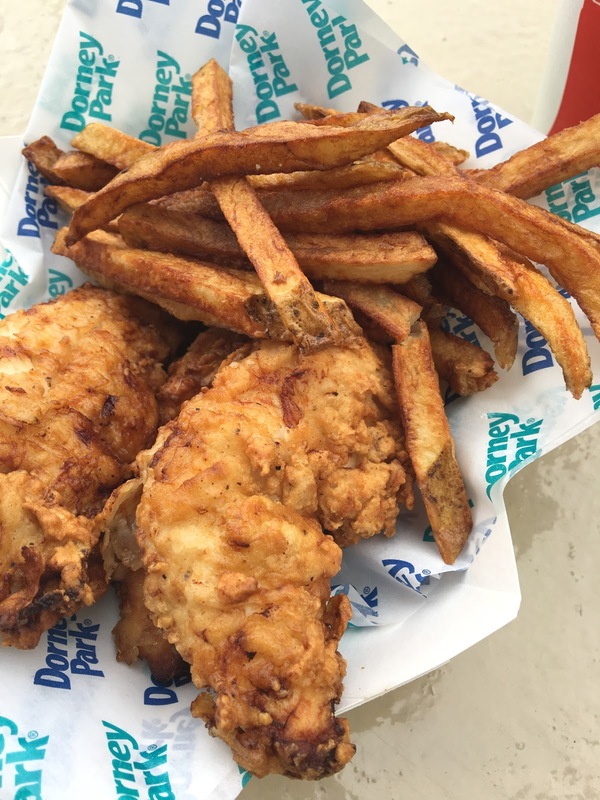 He was proud to point out that visitors who partake in one of the dining plans, whether all season or for a day, have approximately 95 meal combinations to choose from at more than 19 locations within Dorney Park and Wildwater Kingdom. In the end, that's simply a ton of variety if you think about it! 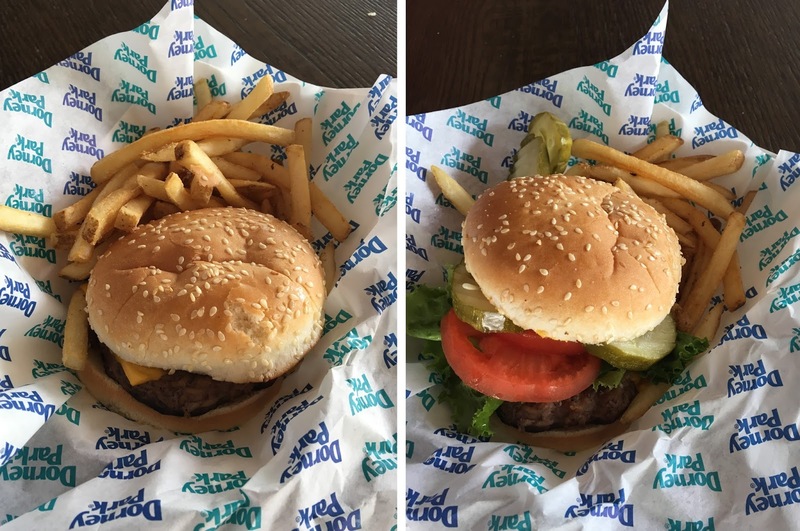 Fresh, hot, juicy cheeseburger from Burger Barn, before and after I added the toppings of my choice! All these offerings can satisfy regardless of what kind of mood visitors are in. A classic cheeseburger from Burger Barn may fit the bill, a location which has seen many improvements this year to add more customization through an add-your-two-topping bar, new clam shell grills for a perfect cook every time and more. That worked for me, as seen in the photo above, but there was still more to explore. "With multiple restaurants I'm looking to make sure that the food is not only traditional offerings but also that we add in things that are new to the park. For example, entree salads, a big game burger, brisket sandwich - things you don't always see at our park," says Chef Jones. Those looking for healthier options have seen an already large variety expanded further. Chef Jones explained that "we really want to take the worry away, when you're here you can enjoy yourself, and there's something for everyone so you can find a lot of diversity in the stands." This includes "healthier lighter choices like entree salads, low calorie sandwiches - we have a veggie tender this year, which is a new item that is a 100 percent vegetable tender as a replacement for a chicken tender made up of all veggie products. We also have gluten free options for chicken tenders." The park has also started to list calorie content on the menus at all locations for guest convenience. Katie also pointed out that their guests regularly give them great feedback on their experiences, noting that many comments were "that everything comes with fries so we've decided to look at some different things to offer like veggie tenders and side salads for healthy and vegetarian options." Often park visitors don't even realize that these healthier options are available, so Dorney Park continues to try to educate them on all that is available. Freshly made hand-breaded chicken tenders with fresh cut fries. I kept on eating as I took in all this information, which included these amazing hand-breaded chicken tenders from Center Stage Fries that are new this year. It's been a couple seasons since the park did these, complete with home made batter that has no artificial flavors. I'll be the first to say that they hit it out of the park with these, easily beating any restaurant chicken tender I can think of. Four of the park's locations have also added touch screen ordering this year, an attempt to "enhance speed of service and give a better experience for the guest," according to Chef Jones. These will allow visitors to speed up the ordering process, and explore all options offered depending on what meal play they have. 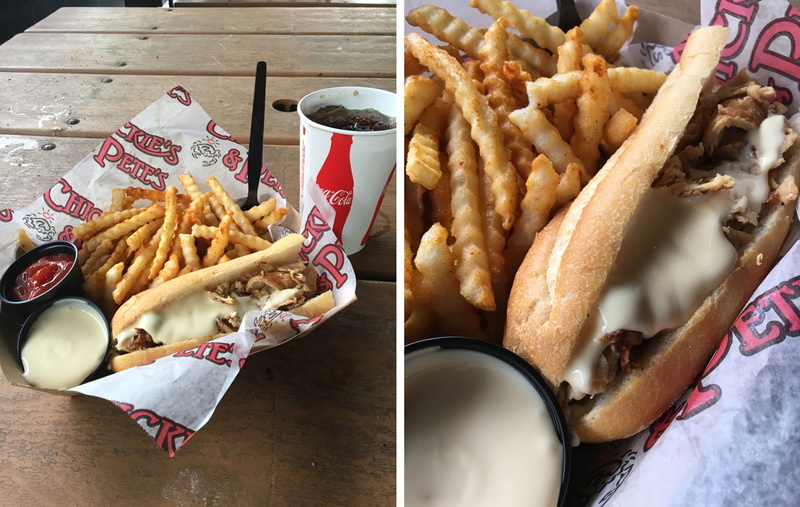 Chickie's and Pete's made me this chicken cheesesteak with crab fries... yum. 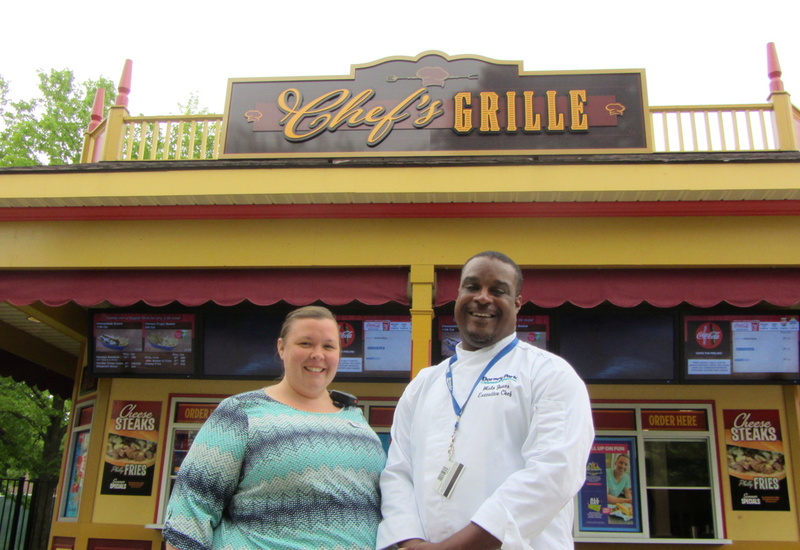 Chef Jones also came up with another way to expand the menu at Dorney Park by renaming Monster Grille to the Chef's Grille for 2017. The location will feature rotating dishes to keep food choices fresh for repeat visitors, perfect for All Season Dining pass holders. Featuring a mix of classics and "cafe bistro style cooking," the Chef's Grill will also be a hot spot for special event related food such as elephant ears and custom donut holes for Haunt. Chef's Grill has started the season by offering an Italian sausage sandwich, but there are already plans for more limited-time options such as feature entree salads like a freshly prepared sesame ginger salad. Italian sausage on toasted roll with peppers and onions. The limited run entrees at Chef's Grille are all designed to be a part of the dining plans, so really the total of 95 options that we reference earlier is even bigger when you factor in these. Hopefully the point that there's a lot to choose from with the park's dining plans is hitting home! Holders of All Season Dining plans can also pay a small upcharge to visit some of the park's special events, this year to be held in the fancy new Parkside Pavilion. These include an upcoming Mother's Day brunch and later in the season the Clambake, Beer and Brats and the All American Barbecue events. In short, I was very impressed at the effort that has been going on to change the scope and quality of Dorney Park's food and beverage program, and eating all the food necessary to write this story was just an added bonus. Many thanks to both Katie and Chef Jones for their help and time. Make sure to stop by the park and try some of these dishes soon!